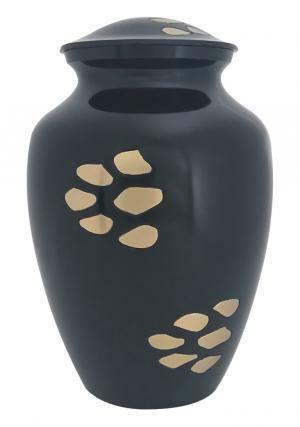 Golden Paw Prints Bedford pet Urn is a brass metal made pet funeral urn. 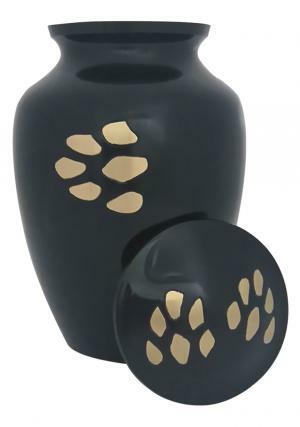 The paw print pet ashes urn is decorated in midnight glossy black with the engravings of gold pet paw prints on the urn. The engravings of paw prints and enamel finish are from professionals experienced in the artwork urn design. The lid of the pet funeral urn is decorated in Paw prints in gold which has secured screw threading for closure and easy insertion of ashes. 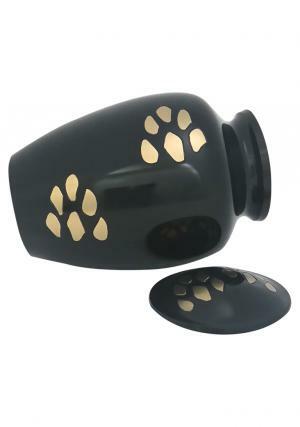 Golden Paw Prints Bedford Pet Cremation Urn is measured to carry up to 30 cubic inch ashes. The Dimensions of the pet urn is 1.51 kg, 8.37 inch height and 5.71 inch in width.